C&C Sutlery's Confederate Great Coats provide both period correct styling as well as warmth. Be sure to have your measurements available when ordering. CLICK HERE for Clothing Measurement Information. We want to ship you the RIGHT size the FIRST time. 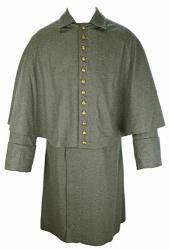 The C&C Sutlery CS Enlisted Foot Greatcoat is worn by Infantry, Heavy Artillery, Hospital Stewards and Engineers. The CS Enlisted Foot Greatcoat is a Single Breasted 5 Button Front Coat with a 6 Button Elbow Length Cape. 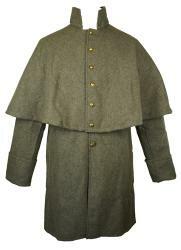 The coat features a Standing, Fold Down Collar and is WITHOUT the Fold Down Cuffs found on Union Greatcoats. The coat is made of 20 oz. Wool with a heavy cotton body lining that extends just below the waist. 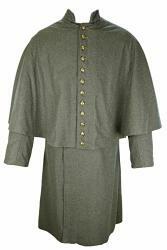 The coat skirt has a split back seam and the belted back features 2 large buttons. The hem is left raw (unhemmed) as per originals. Select CSA, Block "A", Block "I", or Federal Eagle Buttons. Fold Down Cuffs are an option for this coat. 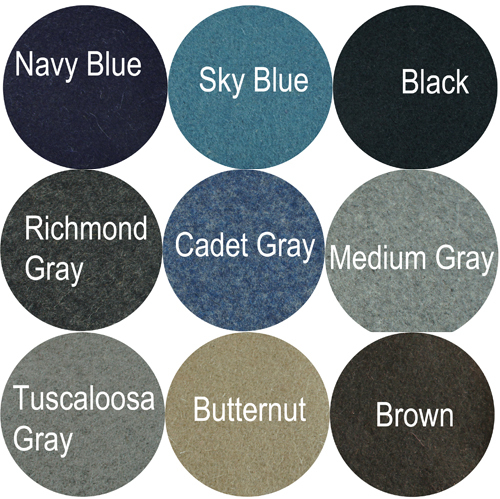 Any Greatcoat in size smaller than 38 or larger than 48 and/or any Greatcoat made in Tall or Short and/or any Greatcoat made in wool other than Sky Blue or Medium Grey is custom made specifically for you and is subject to a MINIMUM 20% restocking fee. Please allow AT MINIMUM 6-8+ weeks for delivery. Click to read our RETURN and EXCHANGE Policy. The C&C Sutlery CS Mounted Greatcoat is a Double Breasted 12 Button Front Coat with a 12 Button Cape that extends to the cuff. 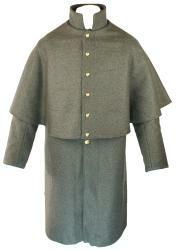 The Coat features a Stand Up Collar and is WITHOUT the Fold Down Cuffs found on Union Greatcoats. The coat is made of 20 oz. Wool with a heavy cotton body lining that extends just below the waist. The coat skirt has a split back seam and the belted back features 2 large buttons. The hem is left raw (unhemmed) as per originals. Select CSA, Block “A”, Block “C”, US Federal Eagle Buttons. CS Staff Eagle Buttons are available for an additional charge. Turn down cuffs are an option for this coat. Any Greatcoat in size smaller than 38 or larger than 48 and/or any Greatcoat made in Tall or Short and/or any Greatcoat made in wool other than Sky Blue or Medium Grey is custom made specifically for you and is subject to a MINIMUM 20% restocking fee. Please allow AT MINIMUM 4-6 weeks for delivery. Click to read our RETURN and EXCHANGE Policy.